This matted display is simply sensational - no other words can do it justice. 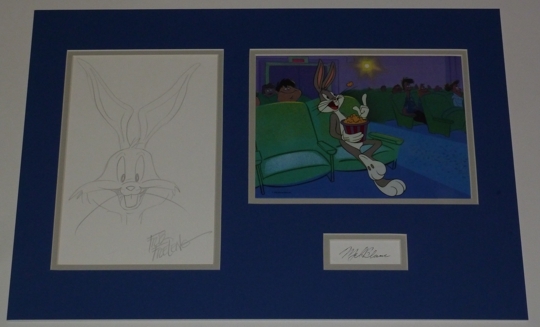 It contains a hand-drawn sketch of Bugs signed by legendary animator Friz Freleng, the rare signature of Mel Blanc (the voice of Bugs) and a very rare sericel of Bugs in a cinema. The cel was issued with a commerative magazine to celebrate Bugs' 50th birthday and can sell for up to $200 by itself. We will also even provide you with the magazine. Friz and Mel's contribution to animation is unbelievable. Read this description in full to find out more about both men. This would make a great investment piece. 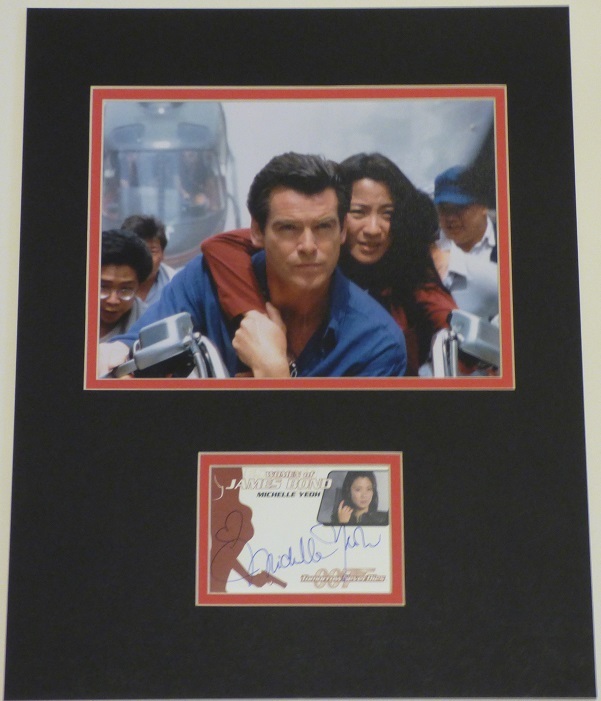 The display has been professionally matted and is ready for a frame of your choice. One of the mainstays of the Warner Bros. cartoon department, Friz Freleng he simply made good cartoons, and kept making them year after year. (He also earned his studio three Academy Awards, for 1947's Tweetie Pie 1955's Speedy Gonzales and 1957's Birds Anonymous) He broke into animation working for fellow Kansas Cityite Walt Disney, and was among the group led by Hugh Harman and Rudolf Ising that struck out on its own in 1927 to make Oswald the Lucky Rabbit cartoons. When Harman and Ising were hired to make cartoons for Warner Bros., Freleng went along, and worked on the very first short the studio released; he was there more than 30 years later when the unit closed its doors. Freleng's forte was musical cartoons, his most famous being Rhapsody in Rivets (1941) in which a skyscraper is built to the strains of Liszt's Second Hungarian Rhapsody. But his real strength was his versatility; he worked well with every character in the Warners stable, though in later years he specialized in Tweety and Sylvester, Speedy Gonzales, and Yosemite Sam (whose creation was inspired, it was said, by the diminutive and sometimes hotheaded Freleng himself). One of his most popular shorts in recent years was just a lark for Freleng at the time: You Ought to Be in Pictures (1940), a delightful blend of live-action and animation in which Daffy Duck convinces Porky Pig to walk out on producer Leon Schlesinger and try his luck in feature films. When Warners decided to shut down its cartoon department in 1963, Freleng and partner David H. DePatie tried to keep the unit intact in order to produce cartoons themselves-and wound up selling shorts back to Warner Bros. when the studio had a change of heart and decided it wanted more cartoons after all! Meanwhile, DePatie-Freleng was establishing itself as a major supplier of animation with its successful Pink Panther series. A renaissance of interest in Warners cartoons in the 1980s led Freleng back to Warners to direct some new segments for TV, and the compilation feature film The Looney Looney Looney Bugs Bunny Movie (1981) and Daffy Duck's Fantastic Island (1983). 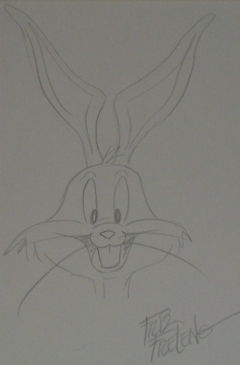 He also produced Bugs Bunny's 3rd Movie: 1001 Rabbit Tales (1982). Friz sadly past away in 1995. Mel Blanc is also known as the man of a thousand voices. He was the supremely talented voice artist and comic actor who gained immortality as the voice of the Warner Bros. cartoon characters, including Bugs Bunny, Daffy Duck, Porky Pig, Tweety and Sylvester, Yosemite Sam, Foghorn Leghorn, and Pepe Le Pew. (The only major speaking character he didn't do was Elmer Fudd, whose voice was provided by radio actor Arthur Q. Bryan.) Blanc joined the studio in 1937, and replaced the previous Porky, who hadn't been able to turn a stutter into a humorous device. Before Warners signed him to a contract in the 1940s, Blanc also performed voices for MGM, Columbia, and other cartoon studios; in fact, he was the original voice of Woody Woodpecker. In later years he was equally busy on TV, as Barney Rubble in "The Flintstones" and as the title character in "Heathcliff," to name just two. Despite his Bug’s connection to them, Mel was allergic to carrots as they tended to affect his vocal cords. Thus he often did the eating sounds last in a recording session and had the sound technicians edit them in the soundtrack as needed. His autobiography, "That's Not All, Folks!" was published in 1988. Mel passed away in 1989, fittingly the epitaph on his headstone in Hollywood Forever Cemetery in Hollywood reads, "That's All Folks!" 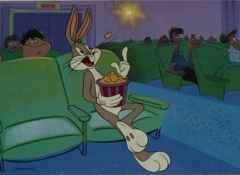 No character -- much less a rabbit -- has captured the American moviegoer's imagination as thoroughly and uproariously as Bugs Bunny. And no character has dominated the medium of animation for as long as the unabashedly bold Brooklyn bunny. Bugs Bunny is arguably the most popular and recognisable cartoon character of all time. Don’t miss this opportunity to obtain a magnificent piece of animation history including a sketch from one of Bug’s fathers, the autograph of his voice and a special piece of birthday animation art. This is one for the connoisseurs of collecting.